Volunteer in Fiji with Projects Abroad and help local communities living on this stunning Pacific island archipelago of Fiji. There are lots of projects to choose from, such as caring for underprivileged children in kindergartens and special needs centres. You can also teach English or help to save the sharks on our Conservation Project. 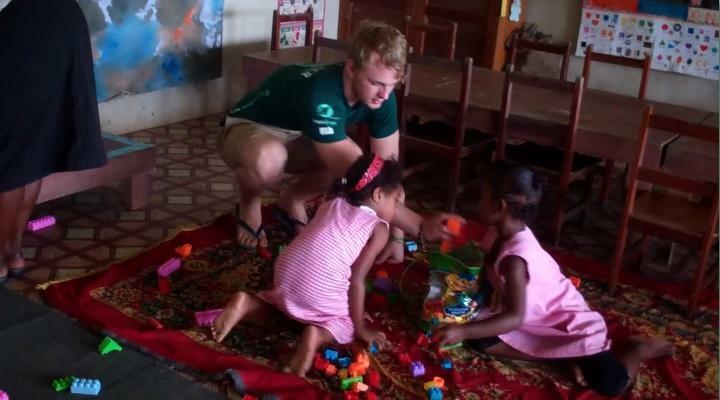 Volunteering in Fiji is open to anyone with a passion for helping others. Our voluntary projects are a world away from the luxury tourist resorts which form many people's perceptions of the islands. Volunteering here gives you the chance to live and work alongside local people. You will discover the real Fiji while having the experience of a lifetime! Projects Abroad Fiji is based on the largest island, Viti Levu. This island is referred to as the 'mainland' by inhabitants of Fiji's hundreds of smaller islands. Our volunteer projects are located in and around the town of Nadi on the west coast of the island, and the Conservation Project is based out of Pacific Harbour on the south coast. You will be met at the airport by Projects Abroad staff and taken to your new home. Unless you are doing the Conservation Project, you will live with a local host family. Volunteers on the Conservation Project stay in shared villa accommodation in Pacific Harbour. Many travellers arrive into Nadi's international airport before flying or catching a boat straight on to their choice of island paradise. However, it is the poorer areas of Fiji's villages and towns which are most in need of volunteer help. Unfortunately, very little of Fiji's income from tourism and sugar trade makes it to the people in these communities. This is where you can make a real difference as a volunteer. The Pacific island archipelago of Fiji is world famous for its perfect white sand beaches and crystal clear calm turquoise waters. However, its rugged emerald green interior with extinct volcanoes and cascading waterfalls is also well worth exploring. Furthermore, the physical perfection of the islands is only half the story. Fiji's relaxed, charming and gracious people will inspire you as much, if not more than the idyllic sunsets. The population of Fiji is a complex mix of indigenous Fijians, Indo-Fijians and descendants of Chinese traders. There are also other Pacific islanders and the British and European explorers and colonialists. As a volunteer in Fiji, you will have the chance to explore the many facets that make up modern Fijian culture. You'll gain a greater understanding of the issues affecting Fiji today. While volunteering in Fiji, you are spoilt for choice in terms of travel opportunities, both at the weekends or after finishing your volunteering placement. The island of Viti Levu, where Projects Abroad is based, is well worth exploring at weekends. There are opportunities for trekking in the dramatic highland interior, remote villages and regular colourful festivals. These will introduce you to the music and customs of traditional Fijian life. Explore a little further afield and join the hunt for the perfect beach. The South West of Viti Levu boasts the best of the island's beaches, with incredible scuba diving at the reefs at Nananu-i-Ra or at the Beqa lagoon. Or take a boat island hopping through the Mamanucas island chain, north west of Nadi for the ultimate in beach relaxation. It would take you months to explore all the islands, but travel through the archipelago has never been more accessible even for those on smaller budgets. So if you have the time, pack a hammock and sarong and head for paradise! With picture-perfect beaches and crystal clear waters, Fiji has a lot to offer. Why not give something back? Volunteer in a kindergarten or special-needs centre and provide a helping hand. Conservation volunteers work on a pioneering shark conservation and protection project in Fiji. Working directly with the Fiji Shark Conservation & Awareness Project and two internationally renowned shark research scientists, volunteers will be directly involved in scientific shark research work. Work with village communities and help tackle some of the main health issues that have resulted from poor diet and unhealthy lifestyle. Teaching in Fiji is a fantastic way to see this beautiful island nation. Work alongside staff in local primary schools and provide effective, practical help with spoken and written English. Volunteer on a Shark Conservation project in Fiji and get involved with diving activities, conducting scientific research, observing scientists catch and tag juvenile sharks, helping with mangrove reforestation, and more. Get up close with some of the most endangered and misunderstood animals in the world during our Shark Conservation in Fiji Grown-up Special, taking part in valuable Conservation activities. As a qualified speech therapist your skills will be used to assist teachers with children who require specialist support in their speech and language.